For sixteen years, Sunn O))) have been challenging the way we think about music. In that relatively brief time, core members Stephen O'Malley and Greg Anderson have forged connections between the worlds of Metal, Drone, Contemporary Composition, Jazz and Minimalism with startling results while remaining true to the eternal principles of volume, density and weight. The release of The Grimmrobe Demos (1999) sent tremors throughout the underground with its bold realisation of hitherto unimagined heaviness. Building on the innovations of Seattle pioneers Earth - and naming a track in honour of their leader Dylan Carlson - Sunn O))) forged even deeper into a realm of reverberating darkness. However it was with the release of ØØ Void (2000) that the duo staked their claim as an outfit that would redefine how we view - and hear - guitar music in the early 21st century. There were detractors and skeptics, of course. But, undeterred, O’Malley and Anderson continued to refine their sound with 2002’s Flight Of The Behemoth, featuring contributions from legendary Japanese Noise artist Masami Akita aka Merzbow. Evolving at a rate contrasting with the pace of their diurnal riffs, Sunn O))) unleashed White1 in 2003. This ambitious sonic document constituted many listeners’ first contact with the outfit and demonstrated the flexibility of their aesthetic. Contributions from Runhild Gammelsaeter (Thorr’s Hammer), Joe Preston (Melvins/Thrones) and the arch-drude himself, Julian Cope, assisted the music’s rapid radiation from its molten core of heavily amplified ambience. Around this time, the mainstream music media started to take an interest: the baffled curiosity that greeted ØØ Void gave way to the suspicion that something not unlike a paradigm shift was taking place. In interviews, O’Malley and Anderson revealed themselves as engaged and articulate ambassadors for the world of sound they had created. Meanwhile, rumours of hooded figures grinding out immense, immersive riffs suggested that Sunn O))) were a live experience to be reckoned with. This was confirmed by a succession of actions including a thunderous performance at London’s Underworld on Halloween 2003, an event preserved for posterity on the live album The Libations Of Samhain (2004). Sunn O)))’s live career is littered with such landmark shows. The group’s performance at Bergen Cathedral, Norway as part of the Borealis Festival was immortalised on vinyl as Dømkirke, for example, and they have staged similarly memorable interventions at many international music festivals including Barcelona’s Sonar (2009), Krakow’s Unsound (2009), CTM Berlin (2013), Japan’s Earthdom (2007) and Leave Them All Behind (2012), North Carolina’s Hopscotch (2012), Australia’s Totally Huge New Music Festival (2007) and All Tomorrow’s Parties/The Nightmare Before Christmas (2003, 2004, 2007 and 2009) and Supersonic (2007 and 2009) in the UK. Sunn O))) also curated the 2011 edition of Holland’s legendary Roadburn Festival, bringing together Keiji Haino, Winter, Scorn, Earth, Voivod and Circle among other heavyweights. By the time White2 followed in 2004 there was no denying the group's impact. The shockwaves travelled internationally and were received eagerly by an audience notable for its diversity. 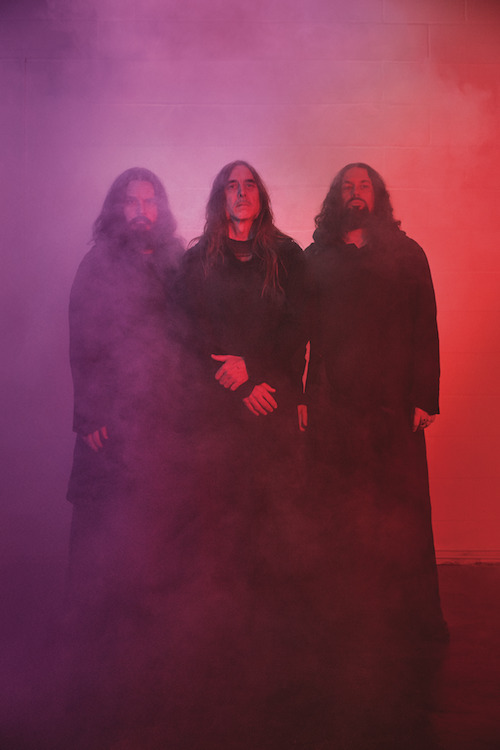 Metalheads, Noiseniks and experimental aficionados were united in their appreciation while countless artists and groups attempted to incorporate Sunn O)))’s visceral churn into their own creations. For their next full-length release, O’Malley and Anderson journeyed deep into the abyss. With Malefic (Xasthur) and Wrest (Leviathan) on vocal duties, Black One was misinterpreted by some as Sunn O)))’s attempt at a Black Metal record. In fact it was, as O’Malley told The Wire Magazine in 2009, “a stark exploration” of certain aspects of their work. However bleak and unforgiving, Black One was their most collaborative effort to date, an approach which similarly informed O’Malley and Anderson’s other major release of 2006, Altar. Co-credited to Japanese rock mutants Boris, this album explored a broad spectrum of sonic strategies from thick, oily miasma to graceful, almost country-ish songcraft. The two groups came together for triumphant live performances of the album at London’s Kentish Town Forum in December 2007 and at ATP New York in September 2010. Advancing from a self-created world and operating on their own terms, Sunn O))) have proven themselves the model of what King Crimson’s Robert Fripp would call a “small, mobile, intelligent unit”. They are capable of expanding or contracting their line-up according to the needs of each project and of moving fluidly between the concert hall and the academy. For a 2006 collaboration with Banks Violette at the Maureen Paley Gallery in London, O’Malley and Anderson performed inside a sealed room while vocalist Attila Csihar clawed his way, vampire-like, out of a black coffin. The audience were permitted to hear - but not see - the sounds created, although the relics of the performance were later preserved in salt and exhibited. That same year, Sunn O))) performed alongside Liars, Burning Star Core and Leopard Leg as part of the music strand of the Frieze Art Fair, filling the London Hippodrome with wave upon wave of amplification with the assistance of Godflesh/Jesu legend Justin Broadrick. Pushing forward in their recorded work but unafraid to embrace their past, in 2008 Sunn O))) announced a number of live shows to mark the tenth anniversary of their first release The Grimmrobe Demos. For these dates, O’Malley and Anderson returned to their original two-man line-up, thereby reminding audiences where and how it all began, exposing once again the fundamental core of their sound. The same year saw Japanese label Daymare Recordings reissue ØØ Void with an extra disc of collaborations with legendary British experimentalists Nurse With Wound. Their sixth album nevertheless indicated a group with its feet planted firmly in the present. Monoliths And Dimensions (2009) retained the heaviness of previous releases whilst incorporating elements of spectralist composition and jazz. The album’s finale, Alice, was the most elegiac and beautiful piece the group had ever recorded, its mood of profound melancholy enhanced by veteran jazz trombonist Julian Priester (Sun Ra/Herbie Hancock) and typically masterful group arrangements courtesy of Eyvind Kang. Recently, Sunn O))) have established a Bandcamp page which serves as an exhaustive archive of their entire back catalogue, including rarities and essential live material. This year has already seen the long-awaited release of their collaborative album with Norway’s Ulver entitled Terrestrials, and the current live line-up, consisting of Stephen O'Malley, Greg Anderson, Attila Csihar and Tos Nieuwenhuizen, is poised and ready to resume live activities.